State, ISFA, Governor, Sam Zell trying one last time to steal from taxpayers. There's been a lot of news on the Cubs sale front of late. The rumblings from many sources is that the 'books' will be sent out to the six prospective ownership groups in a week or two. In what appears to be a last minute attempt to revive the ISFA deal, Jim Thompson (whom I'm losing respect for daily) is now promising that there will be no name change if the state buys Wrigley. This raises two questions. Where's the revenue shortfall going to come from? (If the agency had been planning to sell naming rights, it was probably banking on some revenue.) Well, lets think about the ISFA. It's assets/income opportunities if it purchased the park would come from rent the club pays, concessions, other 'inside the ballpark' revenues, and tax dollars. Now, if there's any drop in 'inside the ballpark' revenues to the new owners, the club is devalued... so that doesn't make a lot of sense for Sam Zell. But, if the new revenues come from the taxpayers, well then everyone can eat the taxpayers' pie and so the new owners and the Tribune can have an extra helping of profit. Similarly, Al Yellon recently had a sit down with Crane Kenney, the Cubs' interim-President. Here's what Crane had to say about taxpayer dollars being used by the ISFA. All right, so I think we’ve already talked about the sources of funding for this transaction will come exclusively from inside this building. So what we would do is we would take what we call the transactional taxes that are paid here, sales taxes that are paid in the building on food, drink, merchandise, amusement taxes that are paid on ticket sales, use taxes, etc. Those taxes that are right now being paid inside the building for money being spent here, we would use a baseline year of 2007 and then all the incremental taxes that otherwise would have been paid into the general coffers above that baseline year would now go to support a bond issue which would renovate the stadium over 30 years. So let me get this straight. What if I wanted to purchase Wrigley Field. Would the state really allow me to set a baseline year of tax payments and not increase those taxes for the next 30 years? For 2008, the Cubs average ticket price, according to TMR, is $42.49 and the FCI is $251.96 or $62.99 per person. Assuming the tax rates didn't change from 1991 to 2008 (they did, but they went up), the tax authorities would have expected 12% of the ticket revenue (entertainment tax) and 10.5% (sales tax) of the rest. In other words, a fair estimate of per fan tax revenue in 1991 was (.12 x 10.10 + .105 x 10.75 =) $2.34 per person. The same estimate using the 2008 levels is (.12 x 42.49 + .105 x 20.50 =) $7.25. (Note that the above paragraph assumes the average fan spends at the FCI amount, but the FCI amount is not developed using average fan expenditures per game. The final factor I'll look at is attendance. In 1991, attendance was 2,314,250. Let's assume 2008 attendance will be at the same level as 2007, or 3,252,462. Using our previous assumptions about tax per fan per game, that brings 1991 tax revenues to approximately $5.4 million and 2008 tax revenues to $23.6 million. In other words, if the ISFA had purchased the stadium in 1991 using the same tax threshold they are suggesting now, the city/county/state authorities would receive $5.4 million of taxes from the Cubs this year and $18.2 million would be redirected to paying off bonds so the state could own Wrigley Field. That's $18.2 million that doesn't go to fix pot holes, hire police and firefighters, or replace broken streetlights in drug-infested neighborhoods. If all of that seems like too many ifs, too many assumptions, let's run the numbers if the deal closes before the end of the season and they adopt 2007 as the baseline. 2007 FCI: 219.21 or $54.80 per person. Average ticket cost was $34.30. So tax revenues would be .12 x 34.30 + .105 x 20.50 = 6.27 per person. We assumed no change in attendance, so the difference is $7.25 - $6.27 = $0.98 per person x 3,252,462 = $3.2 million. So just the incremental tax revenue from 2007 to 2008 is $3.2 million... and that assumption is on the low side because it doesn't factor in the hike in tax rates that occurred in 2008. (Thanks Todd Stroger Jr. and the CTA). 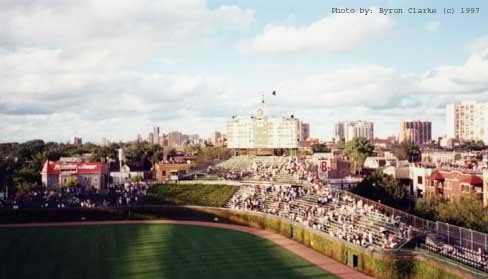 Thus, in it's first year, given the conditions Crane Kenney outlined for Al, the taxpayers would be subsidizing $3.2 million dollars of the Wrigley Field purchase price... and it would grow from there. I'd say write your governor, but Blagojevich is already a fan of corruption... so write your state representative, write your alderman, write your mayor. There's already enough corruption in Chicago politics. Illinois taxpayers don't need to subsidize Sam Zell.